A 67-year-old Tennessee woman was arrested and is now facing serious charges after pulling a gun in a Wal-Mart parking lot on a man who was asking for a lighter, News Channel 5 reports. Sherry McLain insisted that she feared for her life and was acting in self-defense Saturday afternoon when she brandished her weapon after the man, whom the Huffington Post identified as 52-year-old James Crutchfield, asked her, "You got a light?" News Channel 5 did not mention the race of the victim, but HuffPost identified him as black. 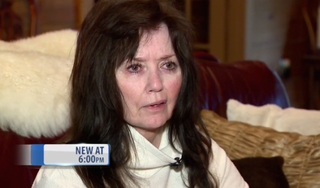 She told News Channel 5, "It scared me absolutely to death. I have never been so afraid of anything in my whole life, I don't think," McLain added. "This guy is the bad guy and I'm the one in handcuffs walking away." Murfreesboro, Tenn., police say, however, that there was no reason for McLain to jump to that conclusion. "There was no reason for her to perceive any legitimate threat," Sgt. Kyle Evans said. Crutchfield, officers noted, had just bought cigarettes and was attempting to get a light from her. Witnesses also confirmed the man's harmless question, and surveillance footage showed that Crutchfield did not come closer than 10 feet to McLain. When she pulled the gun on him, he actually fled, running back into the store and calling 911. "Certainly, pulling a gun on someone who just simply asks a question, who is not displaying a weapon or displaying any aggressive behavior, is not appropriate," Evans said. Witness Keeley Benoit said that McLain was "a gunowner who doesn't need to own a gun," according to News Channel 5. Benoit was with her 7-year-old son when they found themselves caught in the fray, HuffPost reports. She says she saw the man nearby screaming, "This woman is pointing a gun at me!" Benoit also reportedly saw McLain point the weapon in their direction. "The lady kept repeating, 'I'm going to shoot you; I'm going to kill you,' " Benoit told Channel 5. McLain, however, is insistent that she acted appropriately. "What are we supposed to do if we can't protect ourselves? I'm 67 years old," she said. McLain, who has a permit for her gun, was charged with aggravated assault and reckless endangerment. She was released on $15,000 bond, the Huffington Post reports, and her gun was confiscated as evidence. Read more at News Channel 5 and the Huffington Post.